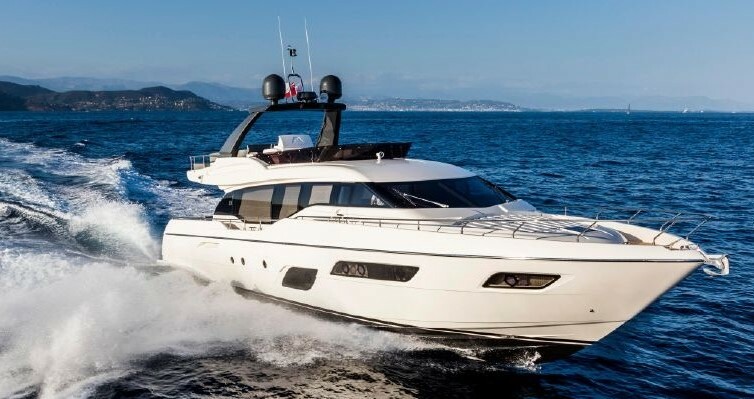 The Ferretti Custom Line Navetta 28 is a project with a great combination of space, design and comfort in navigation. First step to the Megayacht level. This yacht gives you possibility to enjoy both navigation and destination. Our particular yacht is fully loaded with options including gyro and fins stabilizers giving a great navigation for her. Yacht is privately used and never chartered. Interior design is a contemporary style and light colors provide livable feeling for no matter how many days you are staying onboard. Spacious owner's stateroom on the main deck and 4 big cabins on the lower deck together with pullman will give an opportunity for a comfortable stay for 10-12 guests. Upper deck salon/ dining area with round panoramic doors to the cockpit provides great usage of the area as open air, indoor air conditioning when needed and almost 300 degrees spectacular view on the sea. Beach club area with foldable platform of 15 m2 and 4,5m tender that can be launched without a davit are another benefits of the yacht. Yacht is in a perfect condition. Don’t miss the opportunity! SYS Yacht Sales is pleased to assist you in the purchase of this vessel. This boat is centrally listed by Marine House Arcadia.